The problem is, the authors have neither provided any references nor a method explaining how this was calculated, so I find their figures extremely doubtful. There is some evidence to suggest that yields from hydroponics might be higher than ground-grown produce but a forty thousand percent difference is way too much. For instance, here’s a paper (http://pubs.aic.ca/doi/pdf/10.4141/cjss89-030) that directly compares soil and hydroponically produced maize and finds that the soil-grown maize yield is 75-80% of those in the hydroponic system (p.301). The other thing that your vertical-farm reference doesn’t give is the diet that this 28m2 is based upon. Presumably it includes the diet shown in the images so there would be white meat but no red meat (I’m ignoring the picture of the pig – pigs eat about as much food as people so it makes little sense to keep them in a vertical farm unless as a pet!). 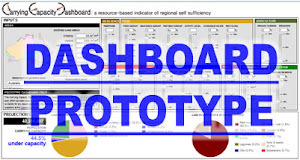 So, adjusting the Carrying Capacity Dashboard to only include white, not red meat, reduces the area of soil-grown production to 3000m2. This is for the current Australian diet and assumes 100% recycling. If we get rid of meat altogether and eat a vegan diet, this can be reduced to about 1000m2 per person. 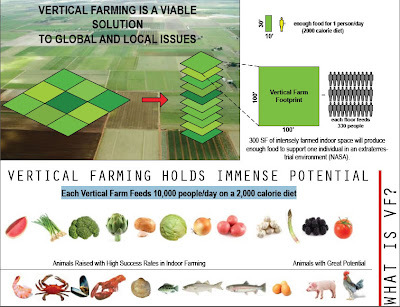 And then, it is unlikely that we would grow grains, fruit/nut trees and legumes in vertical farms as they take too much space so just the vegetable component of this vegan diet is 143m2. Now, if we take just that one previous comparative study as a benchmark (even though taking only one study might not be an accurate comparison), perhaps we could reduce that amount by 75-80% (assuming a higher hydroponic yield) to come up with 110m2 per person just for hydroponic vegetable requirements. So, maybe this might be getting closer to the figure that you are after but is still 4 times larger than the vertical farm example and only includes about a quarter (by food weight consumed) of the whole diet. The important thing here concerns substantiation. Estimating the food requirements of a population is dependent on a myriad of factors such as diet, culture, location, resources, wastage and recycling practices. Unless these aspects are both reliably incorporated into the modelling and the data underpinning any calculations is well-documented, then the carrying capacity estimates are often meaningless. Sweeping statements about the ability of certain landscapes and production systems to feed populations seem awe-inspiring but if in the future we need to rely on such modelling to actually feed people, unsubstantiated or exaggerated claims could prove potentially disastrous.